Housed in non-PVC "flip" holder, with certificate indicating "matte" Finish. Final mintage (of all issue types combined) will be 1,964. 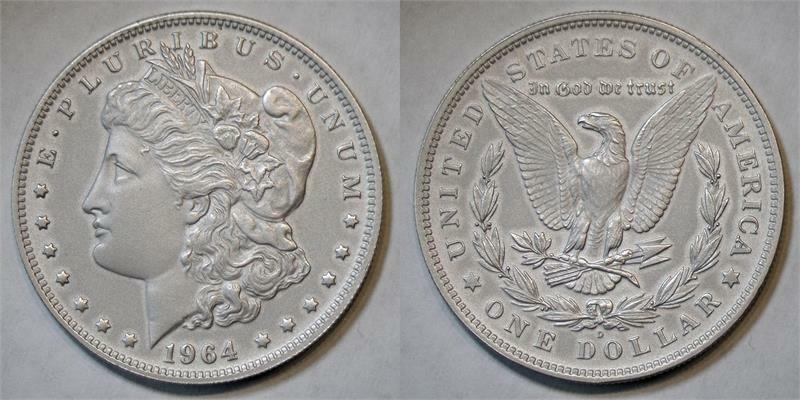 The 1964-D Morgan silver dollar is a coin that almost was. When the US Mint was instructed to start producing 1964 silver dollars, the order did not specify what design to use. So the US Mint investigated using the Morgan design and the Peace design. Eventually the Peace design was chosen and 316,076 1964-D Peace silver dollars were struck at the Denver Mint in May of 1965. Those coins were subsequently destroyed. No 1964 Morgan dollars were minted. In September 2016 a Coin World article revealed that archives at the US Mint in Philadelphia contain galvanos and master hubs for 1964 Morgan and 1964 Peace dollars. According to the article, none of the hubs and master dies found have a "D" mint mark.